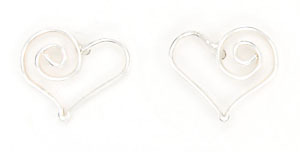 Sterling silver open heart wire earrings. They measure approximately 3/8" long by 7/16" wide. Made by Navajo artisan Marilyn Preston.